My garden zucchini are not as lucky as my balcony vegetables. I've not seen a praying mantis in my garden, although there is certainly a feast to be had there. Little black aphids have made themselves at home in the patch, and the plants are beginning to show some signs of wear. Ants, aphid partners in crime if you will, are present and signal that there is enough honeydew present for them to come out to harvest. The farmers zucchini have recovered nicely from their bought with these little buggers, and I confess to hoping mine would also weather the storm. Yesterday though, they looked quite miserable. Some stems and leaves are beginning to turn yellow, and there's some blossom drop and leaf curl, too. Unlike America where gardeners steal out at night to slip zucchini into neighbor's mailboxes, here it is a short-season crop. By mid-summer the plants bear a striking resemblance to people as they wither and wilt in the heat and humidity Tokyo dishes out. Something of a specialty crop, zucchini could only be found on an Italian restaurant menu, not supermarket shelves until recently. It's a relatively high-priced vegetable here (roughly $2.00 for ONE), too. Raised from seeds, I've got a bit of an attachment to these little ones, as I'm hoping to make at least one batch of zucchini pickles before their season ends. I've really got no time for aphids. Feeling more than a bit silly, I laid aluminum foil out under the plants. A number of different sources recommend this strategy - including the farmers - and so I'm giving it a go. The reflection of light confuses the aphids, and prevents them from landing. 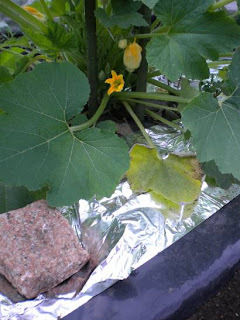 Construction paper coated with aluminum foil is the often recommended mulch, but I opted for average aluminum foil (easy to maneuver under the plants) held down with bricks. This strategy is not always as effective on larger, more mature plants since they manage to block some of the reflected light; however, it seems like it's worth a shot. 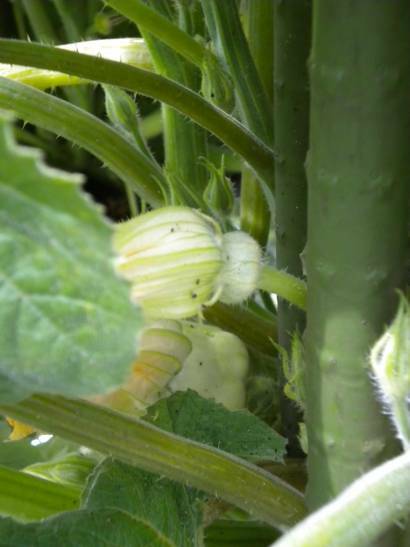 The additional heat and can also result in a higher yield, but many sources also warn that as the season progresses and heat increases the plants need to be monitored for over-heating. The aphid population is large enough and doing enough damage that I'm also choosing to use a neem spray. One of many organic methods out there, the oil results from the pressing of the fruit and nuts of the neem tree. Everything from a snack to medicine to a sacred beverage in its native India, neem oil and spray is now also part of the medicine cabinet for organic growers large and small . Neem oil disorients pests as well as suffocating them. Eventually taken up in the deep tissue of plants, neem won't affect future aphids (their little proboscis's don't penetrate that far), but it does mean it deters other pests from chomping on my plants. Beneficial insects are protected because they're not eating the plants in the first place, and humans already eat neem in many forms so it's not harmful to ingest, especially in these very small amounts. Recommended for a severe problem, I'll be out this evening in the patch carefully applying it and hoping to see a harvest. I found it at a garden center near Musashi Sakai. You may need to venture to a home center or order it on the internet. Let me know how it goes!